A military medal with a Warminster connection is currently for sale in a catalogue-only auction online. "A fine Colonial Auxiliary Forces Long Service Medal, GVR bust, awarded to Major G.H. Wakeman, Hong Kong Rifle Volunteer Corps, late 1st Volunteer Battalion, Wiltshire Regiment, who having studied at Caius College, Cambridge, was commissioned into the Volunteer Force in 1887, and having gone out to Hong Kong, became Land Officer and Official Receiver in Bankruptcy with the Hong Kong Civil Service, and Crown Solicitor at Hong Kong. 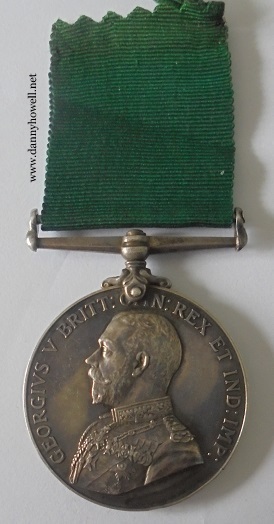 Colonial Auxiliary Forces Long Service Medal, GVR bust, officially engraved naming; (MAJOR G.H. WAKEMAN APRIL 1918). George Herbert Wakeman was born on 14th June 1866 in Warminster, Wiltshire, the son of Herbert John and Ellen Wakeman. Educated at Bradfield College in Reading, he then went on to study law at Caius College, Cambridge, and having matriculated in 1885. Commissioned in 1887 as a 2nd Lieutenant into the 1st Volunteer Battalion, Wiltshire Regiment, he was promoted to Lieutenant on 8th February 1890, and then opted to follow in his father’s footsteps, became a solicitor, being admitted in July 1891, and practised in Warminster. Wakeman was promoted to Captain with the Volunteer Force on 21st April 1894. 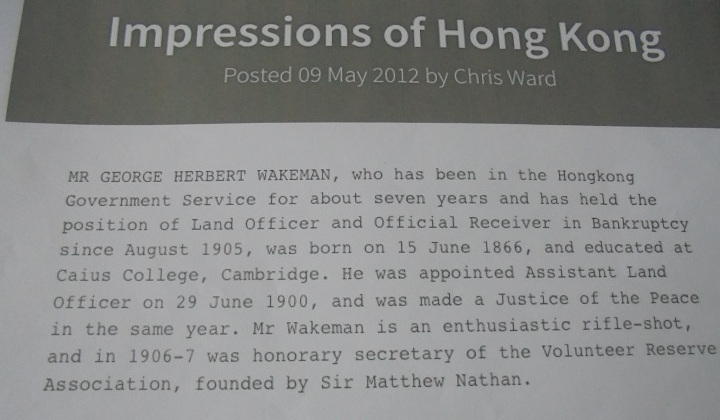 Wakeman then went out to Hong Kong, where he resided on Peak Road, and was appointed Assistant Land Officer with the Hong Kong Civil Service on 29th June 1900. Wakeman then became the Land Officer and Official Receiver in Bankruptcy in August 1905. An enthusiastic rifle shot, he retained his links with the Volunteer Force out there, and joined the Colonial Volunteers as a Captain with the Hong Kong Rifle Volunteer Corps. From 1906 to 1907 he was honorary secretary of the Volunteer Reserve Association, and became President of the Committee of the Hong Kong Volunteer Reserve in 1912. Wakeman was ultimately promoted to Major, and received the Colonial Auxiliary Forces Long Service Medal in April 1918. 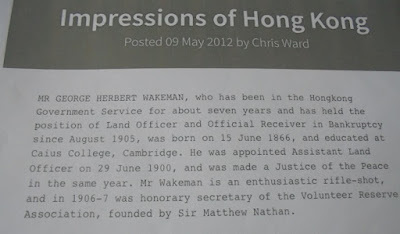 Wakeman was some time a Justice of the Peace and also a Crown Solicitor at Hong Kong, and worked in the Land Office out there till 1933. Having returned to England, Wakeman settled in Worthing, Sussex, and died there on 6th October 1937, his death being reported in The Times on 8th October 1937." The auctioneer's estimate for this medal, which is described as in "good very fine" condition, is £180 to £200 (GBP). The opening bid is £180. The auction ends at 9.00 p.m. (GMT) on Thursday 22nd February 2018. Wellington Auctions, are an online auction specialist dealing in Medals & Militaria. Their correspondence only address is: 37 Rookery Lane, Great Totham, Maldon, Essex, CM9 8DF. Telephone: 07976 266293.